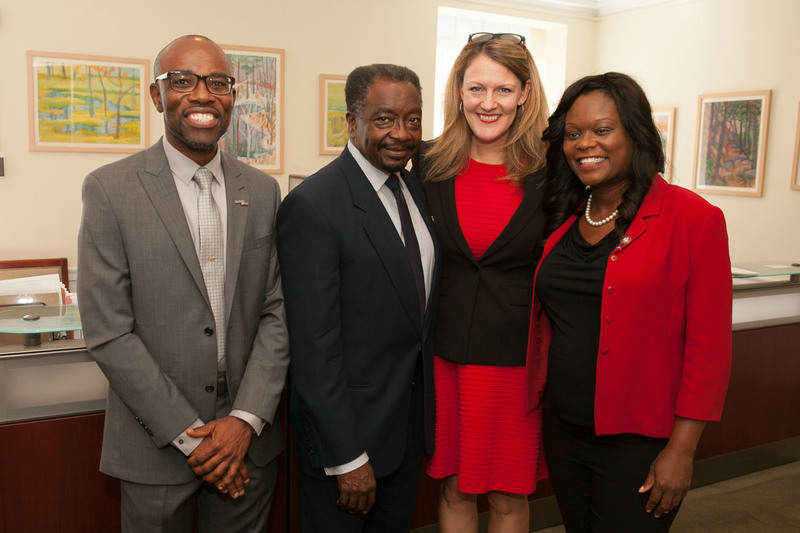 Internationally noted scholar and author Jean Eddy Saint Paul, Ph.D. was officially welcomed as the founding director of the new CUNY Haitian Studies Institute (CUNY-HSI) at Brooklyn College in an Aug. 24 reception on the college’s campus. 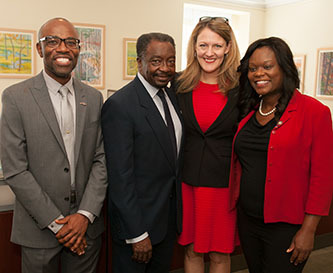 The CUNY-HSI will be a leading institute in the nation, contributing to the body of knowledge about Haitians and the Haitian Diaspora, and advancing the intellectual field of Haitian Studies through research, analysis of public policy, and scholarly practice impacting people of Haitian origin in New York State and other parts of the Haitian diaspora. Saint Paul, who hails from Haiti, is the author of The Militias in Haiti: Sociology of Chimè and Tontons Macoutes, in addition to dozens of articles and book chapters. His broad-ranging scholarship encompasses such topics as state and social policies; democracy, civil society, the politics of memory, and citizenship in Haiti and the Caribbean; religious pluralism and democracy; and sociology of crime and violence in the Haitian State. Most recently, Saint Paul was a professor of sociology and politics at the University of Guanajuato, in Mexico. He served for 12 years as head of the library and as a member of the faculty of human sciences at the State University of Haiti, Port-au-Prince. Saint Paul holds a Ph.D. in sociology from El Colegio de México, and was the first Haitian to do so. He also holds an M.A. in Latin American studies from Javeriana Pontificia University in Bogotá, Colombia and a B.A. in social work from the State University of Haiti. Saint Paul has been a visiting scholar at the Carter G. Woodson Institute for African-American and African Studies, at the University of Virginia, and a visiting fellow at the Centre d’èstudes et de recherches internationals in Paris. "I conceive the Haitian Studies Institute as an academic unit to improve research about Haiti and the Diaspora community," Saint Paul said. "My commitment is to work to establish a leading research center with national and international recognition. This new institution has tremendous need for financial contributions to create a visiting professorship, a digital library, and a first-class academic website as a resource for researchers." Although the CUNY-HSI will be a multi-focal institute that will draw on contributions from various CUNY campuses, it will be based at Brooklyn College. Brooklyn is home to 62,500 foreign-born Haitians. The institute’s three-fold mission is to contribute to the body of knowledge about Haitians and the Haitian Diaspora, and advance the intellectual field of Haitian Studies through interdisciplinary research and practice; facilitate a community of and collaboration with emerging scholars, public intellectuals, university professors and students, school teachers, and educational institutions conducting research on, or otherwise serving, Haiti and the Haitian Community; and engage in analysis and research practice to better understand policy and programs directed at Haiti and the Haitian community. To view outtakes of the reception, visit our Facebook page.